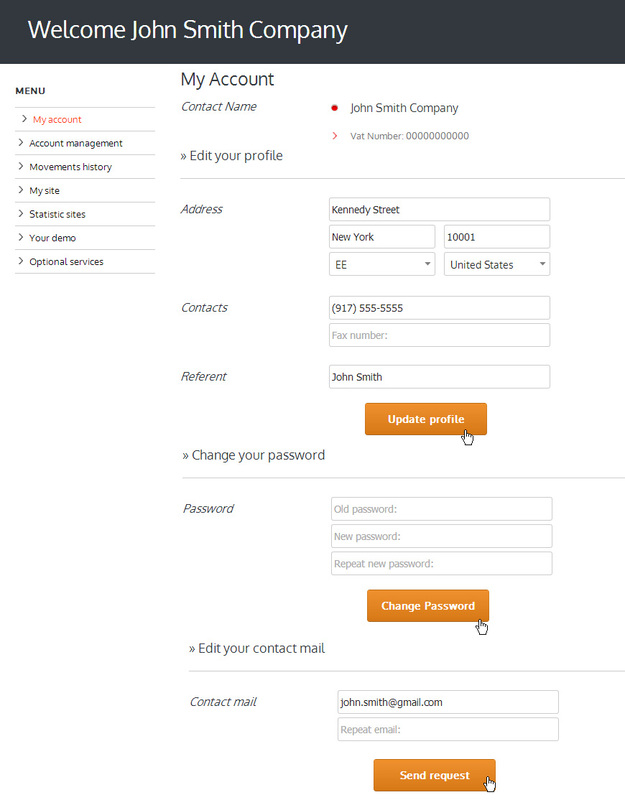 If you see your user profile you need to log in to yourÂ Account Webee.Â Go toÂ www.webee.it website and click on "reserved area" on top-right side. From this page you can proceed to the payment of the invoices. you can decide to pay by credit card (secure transaction via paypal) or if you desire by bank transfer. 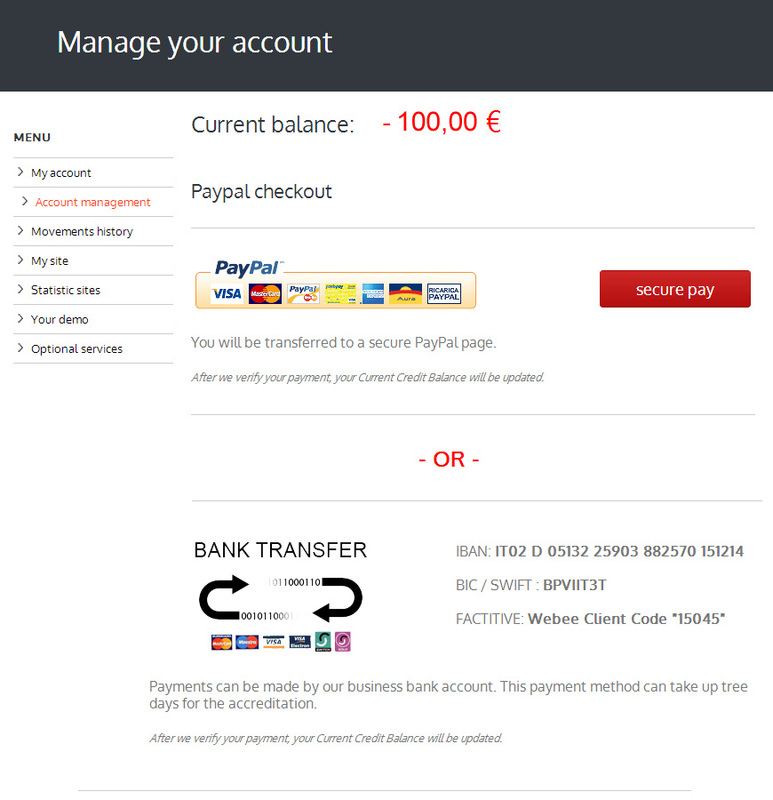 From this page you can manage the payment status and download your invoices. 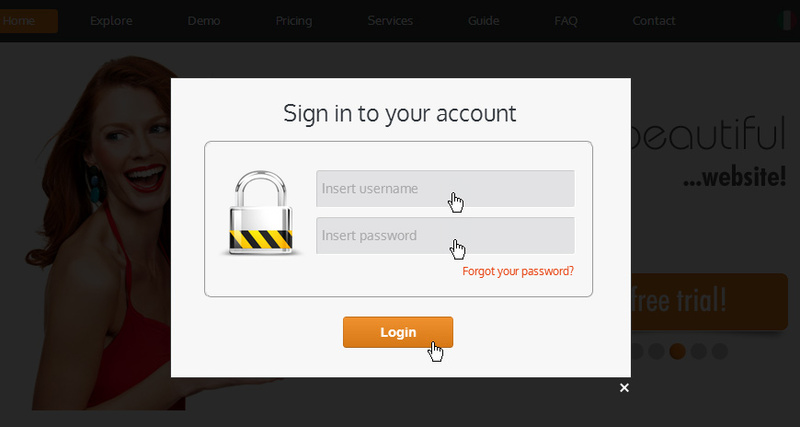 After clicking on publish button you have to create your first email on the purchased domain and enter the yourÂ password. From this page you can see the statistics of yourÂ site clicking onÂ "STATISTICS" button. If you click onÂ + new demo,Â you can create additional free webee demoÂ (you wilÂ decide to buy it or not). From this page you can buy addictional services to increase the potential of your site. Supposing that you want to buy theÂ ecommerce service. You have to click onÂ ecommerceÂ and put on add to cart as the image below shows. Now we will be ask you to indicate in which domain you want to connect the serviceÂ (you may have boughtÂ different domains with our system). Choose the domain and click on proceed. If you view theÂ "Moviment History" menu you canÂ download theÂ invoice of optional service. To pay the invoice go to Manage accountÂ andÂ proceed with the payment you desire. The services will be enable immediatelyÂ after receiving the payment.